Liking where you work is not an optional luxury. At least it sure shouldn’t be. Spending 40 hours of every week at a place you dread is a tough way to go through any stretch of life. I’ve been there and I’m sure many of you have as well — especially if you work in digital marketing, which can often be a fast-paced, demanding, and stressful field. So last year, when I decided to pursue a new professional venture, finding the right culture fit was a huge priority for me. As I started exploring the possibility of joining the TopRank Marketing team, I had some reservations; not because of anything specific to the company, but because it’s an agency. I hadn’t work at agencies much in the past. I was familiar with the stereotypes, the paradigms, the lamentations. While confident in my skill set being very applicable in this world, I couldn’t help but wonder if it was the right world for me. Would the constant reality of client demands stifle my creativity? Would the permeating structure of workflow management systems prove suffocating? Would I be intimidated as a newbie working alongside people who’ve been in such a setting forever? Well, as you can tell, I took the plunge. And I’m very glad I did. 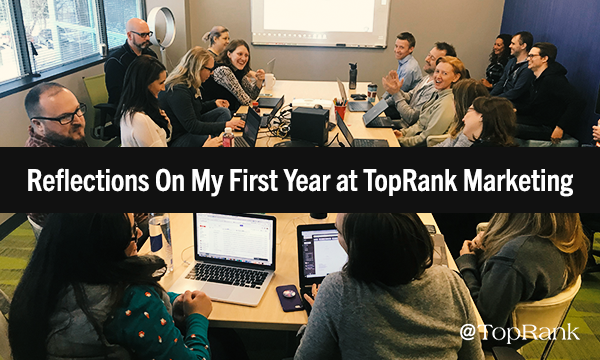 I’m coming up on my one-year anniversary here at TopRank Marketing and can happily say that up to this point, it has been an extremely rewarding experience, unhindered by those negative agency archetypes mentioned above. If you’re a talented writer, strategist, SEO or analyst considering a career move, I highly recommend checking out TopRank Marketing — even if you’ve never worked in an agency. Here are five reasons I’ve felt right at home. I’m not just talking about dress code. The environment here here strikes the right balance between business and casual. In the years prior to coming aboard, I’d spent time working downtown at a big corporate bank as well as at an ultra-leisurely tech startup, so I’ve experienced both ends of the spectrum and didn’t love either extreme. I know from speaking to others that certain agencies can veer a little too far in the direction of informality, with flip-flops and Monday morning mimosas and lax attendance standards. From my view, these kinds of things can quickly become distractions, preventing people from being seriously focused on their work. At TopRank Marketing, the vibe is laid back enough that it’s always comfortable and easygoing, but not so much that anyone is apt to lose sight of their duties or commitments. Working with big-league clients also helps us keep our eyes on the prize. One thing that has become quite clear to me in my time at TopRank Marketing is that we are very deliberate about the businesses we engage as an agency. There’s a strong emphasis on finding the right fits and aiming high. Partnering with recognizable and respected enterprise companies such as Dell, LinkedIn, and SAP keeps us on our toes and challenges us to raise the bar. I’m continually impressed by the innovation and big thinking on display in these organizations. During client meetings, I get to interact with sharp people and I find there’s a high degree of mutual respect. I haven’t personally encountered exasperations with companies that just don’t “get it,” which I hear a lot about from friends and peers working at other agencies. Not only do our clients keep me on my toes — so do my coworkers. To me, this is probably the most invigorating aspect of working at TopRank Marketing. Each day I get the chance to absorb knowledge from tremendously adept and skilled pros in various disciplines. This is by design; attracting and retaining high-caliber talent is central to our operation. The collaborative culture enables our team to collectively reach new heights. I’m fortunate to build out my own expertise by learning from our specialists in search, SEO, strategy, analytics, design, content and more. Hopefully I’m able to impart some of my own knowledge as well. Just a few months after starting here at TopRank Marketing, I was able to attend Digital Summit Minneapolis and rub shoulders with some of the industry’s biggest names as a representative of our agency. It was a cool opportunity right out of the gates, and speaks to the windows that are opened for anyone with such aspirations. I’ve also gotten to write several times for the renowned TopRank blog, providing me with a platform for visibility and brand-building in the marketing community. As employees we are adamantly encouraged to branch out, gain new competencies, take on speaking engagements, and become public faces for the agency if they show that initiative. There’s a very legitimate and earnest focus on personal development that I believe to be rare. It’s honestly cool to tell people where I work. I’ve quickly learned that TopRank Marketing has a stellar rep, fueled in large part by our CEO Lee Odden, who regularly appears as a keynote speaker all around the world promoting our brand and extolling our talent. Being able to work with prestigious international clients gives me a daily feeling of impact and accomplishment. There’s also a certain thrill inherent to being on the cutting edge with so many tactics and frontiers — most notably B2B influencer marketing at the moment. I’m not going to say it’s easy, nor that every day is free of stress or struggle. But I’m not sure I would even want that. I will say that on those more difficult days, I always have the support and structure necessary to overcome. I had no idea what to expect with my first real venture into the agency world, but what I’ve found at TopRank Marketing is an accommodating environment, meaningful work, amazing colleagues, clear avenues for growth, and a real sense of pride. That pretty much covers the checklist I had coming in. If yours looks similar, and you think you’ve got a professional skill set befitting one of our openings, you should get in touch and see if TopRank Marketing might be a match for you. Even if the word “agency” makes you bristle a little bit. I might be biased, but not without good reason.